Terry and Roxanne Wilson have written over 200 articles for warmwater species that have appeared in many national and regional magazines in the past 30 years. They are regular contributors to The Flyfisher and staff writers for Outdoor Guide and Driftwood Outdoors. They are the authors of three other books, Bluegill Fly Fishing & Flies, Largemouth Bass Fly Fishing: Beyond the Basics, and Smallmouth Bass Fly Fishing: A Practical Guide. Terry Wilson and his wife Roaxanne have explored the life of the crappie and found many good things about a fish that hasn't got much respect in the past. Crappie are voracious feeders and strong fighters and you can fish for them year round. 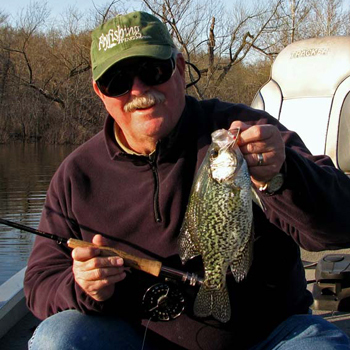 Listen in to hear about crappie behavior, habits, how to catch them and what flies to use. Terry Wilson and his wife Roaxanne have fished intensely for many warmwater species and largemouth bass is one of their favorites. Listen in and learn about habitat, approach, delivery, fly animation, fishing the shallows, the vertical drop, fishing the mid-depths, going deep and much more. They are the creators of many warmwater flies including “Bully’s Bluegill Spider.” Terry and Roxanne are affiliated with Whiting, Redington, Sage, and Rio. Terry is President of the Tri-Lakes Fly Fishers and both the Wilsons serve on the board of Missouri Outdoor Communicators. Their newest flies can be seen at www.thebluegillpond.com.